The best way to learn data science is to do data science. No second thought about it! One of the ways, I do this is continuously look for interesting work done by other community members. Once I understand the project, I do / improve the project on my own. Honestly, I can’t think of a better way to learn data science. As part of my search, I came across a study on sentiment analysis of Chennai Floods on Analytics Vidhya. 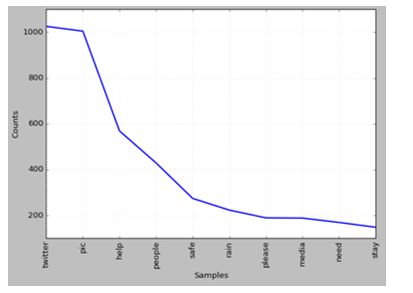 I decided to perform sentiment analysis of the same study using Python and add it here. Well, what can be better than building onto something great. To get acquainted with the crisis of Chennai Floods, 2015 you can read the complete study here. This study was done on a set of social interactions limited to the first two days of Chennai Floods in December 2015. The objectives of this article is to understand the different subjects of interactions during the floods using Python. Grouping similar messages together with emphasis on predominant themes (rescue, food, supplies, ambulance calls) can help government and other authorities to act in the right manner during the crisis time. A typical tweet is mostly a text message within limit of 140 characters. #hashtags convey subject of the tweet whereas @user seeks attention of that user. Forwarding is denoted by ‘rt’ (retweet) and is a measure of its popularity. One can like a tweet by making it ‘favorite’. 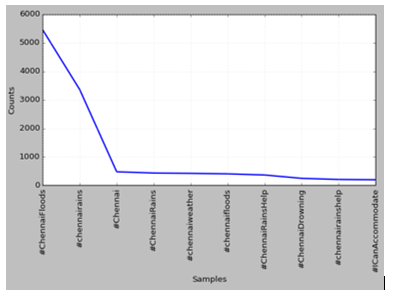 About 6000 twits were collected with ‘#ChennaiFloods’ hashtag and between 1st and 2nd Dec 2015. 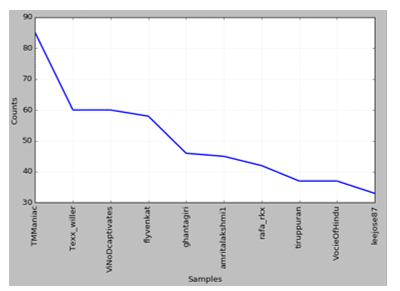 Jefferson’s GetOldTweets utility (got) was used in Python 2.7 to collect the older tweets. One can store the tweets either in a csv file or to a database like MongoDb to be used for further processing. Tweets stored in MongoDB can be accessed from another python script. Following example shows how the whole db was converted to Pandas dataframe. As seen in the study the most used tags were “#chennairains”, “#ICanAccommodate”, apart from the original query tag “#ChennaiFloods”. All tweets are processed to remove unnecessary things like links, non-English words, stopwords, punctuation’s, etc. from nltk.tokenize import TweetTokenizer from nltk.corpus import stopwords import re, string import nltk tweets_texts = df["text"].tolist() stopwords=stopwords.words('english') english_vocab = set(w.lower() for w in nltk.corpus.words.words()) def process_tweet_text(tweet):   if tweet.startswith('@null'):       return "[Tweet not available]"
The words are plotted again to find the most frequently used terms. A few simple words repeat more often than others: ’help’, ‘people’, ‘stay’, ’safe’, etc. These are immediate reactions and responses to the crisis. Some infrequent terms are [(‘fit’, 1), (‘bible’, 1), (‘disappear’, 1), (‘regulated’, 1), (‘doom’, 1)]. Collocations are the words that are found together. They can be bi-grams (two words together) or phrases like trigrams (3 words) or n-grams (n words). These depict the disastrous situation, like “stay safe”, “rescue team”, even a commonly used Hindi phrase “pani pani” (lots of water). In such crisis situations, lots of similar tweets are generated. They can be grouped together in clusters based on closeness or ‘distance’ amongst them. Artem Lukanin has explained the process in details here. TF-IDF method is used to vectorize the tweets and then cosine distance is measured to assess the similarity. Each tweet is pre-processed and added to a list. The list is fed to TFIDF Vectorizer to convert each tweet into a vector. Each value in the vector depends on how many times a word or a term appears in the tweet (TF) and on how rare it is amongst all tweets/documents (IDF). Below is a visual representation of TFIDF matrix it generates. Before using the Vectorizer, the pre-processed tweets are added in the data frame so that each tweets association with other parameters like id, user is maintained. 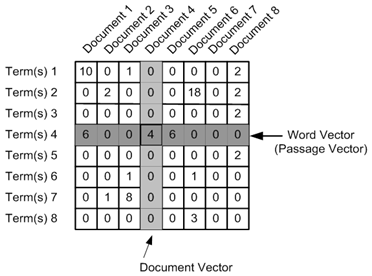 Vectorization is done using 1-3 n-grams, meaning phrases with 1,2,3 words are used to compute frequencies, i.e. TF IDF values. One can get cosine similarity amongst tweets/documents as well. K-means clustering algorithm is used to group tweets into choosen number (say, 3) of groups. The output shows 3 clusters, with following number of tweets in respective clusters. Most of the tweets are clustered around in group Id =1. Remaining are in group id 2 and id 0. LDA is commonly used to identify chosen number (say, 6) topics. Refer tutorial for more details. The output gives us following set of words for each topic. It is clear from the words associated with the topics that they represent certain sentiments. Topic 0 is about Caution, Topic 1 is about Help, Topic 2 is about News, etc. Once trained model is ready the tweet-vectors available in model can be clustered using K-means. The result is the list of topics and commonly used words in each, respectively. It is clear from the words associated with the topics that they represent certain sentiments. Topic 0 is about Caution, Topic 1 is about Actions, Topic 2 is about Climate, etc.The result is the list of topics and commonly used words in each, respectively. This article shows how to implement Capstone-Chennai Floods study using Python and its libraries. With this tutorial, one can get introduction to various Natural Language Processing (NLP) workflows such as accessing twitter data, pre-processing text, explorations, clustering and topic modeling.